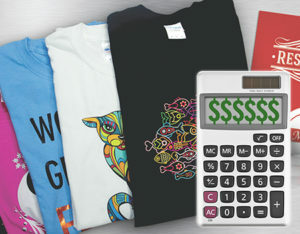 One of the advantages of laser transfer garment decoration is the lower cost of toner vs. ink. But there are variables that affect the cost of laser transfers just as there are with inkjet printers. Some transfer papers cost more than others. Wouldn’t it be nice if you could choose your transfer paper based on a target margin? White toner costs more than process colors . The opacity of the white layer has a big impact on image quality. How much is enough? Wouldn’t it be grand if you could see how the opacity level of your white layer effects cost and margins? Now you can. The latest version of TransferRIP has a cost calculator that lets you do all of these and much more. You can configure it to match your choices of paper and toner. And you can run a report to see exactly what a transfer will cost before you print it. How cool is that? How does it work? Read on. For those unfamiliar with the product, a brief review might be helpful. iColor TransferRIP is a software application that comes bundled with the iColor 500 and iColor 600 LED laser transfer printers. Forever TransferRIP is available as an optional upgrade for OKI textile transfer printers. There are a few differences between the two versions, but they most features are common to both. TransferRIP simplifies the design process, reduces toner cost, and softens transfers by breaking the layers of toner into perforated patterns similar to halftones used in offset printing. For a complete review of TransferRIP’s basic functions, click here and take a little detour. In addition to those basic functions, TransferRIP offers layout and cost calculation tools. The layout tool allows you to add several images to one transfer and arrange them to your liking. But today’s topic is the cost calculator. Currency and Measurement. The default currency is in Euros, and the default measurements are metric. To change these to dollars and inches, start at the TransferRIP home page and click on System. From the drop-down menu, click Global Settings. In the Global Settings window, you can easily change the currency to $ and the Measure Units to inches (Fig 1). Cost Data: This is where the rubber meets the road. The RIP needs to know the size and cost of your paper as well as the cost, yield, and coverage information for your toner and drum cartridges. You’ll have to enter this data to setup the calculation module. You can find your toner cost on our web site, in our catalog, or on your your most recent invoice. You can find toner yield and coverage information on page 43 of the TransferRIP User Manual. Yield is an estimate of how many transfers each toner cartridge will print before the toner is used up. The yield for each of the iColor 500 CMYK cartridges is 11,500. These are not guarantees. They’re estimates based on published performance results based on laboratory testing. Your mileage may vary. Fig 2. Build your configurations here. Coverage: You’ll notice that the default value for coverage is 5%. According to UniNet Technical Director Mike Josiah, this is the printing industry standard used by both ASTM and ISO. But it’s based on laser page printers in office environments where most of what’s printed is text. Mike says most people in the garment decoration industry print graphics that are closer to 20 – 30%. If that applies to your designs, change this value to give yourself more accurate calculation data. 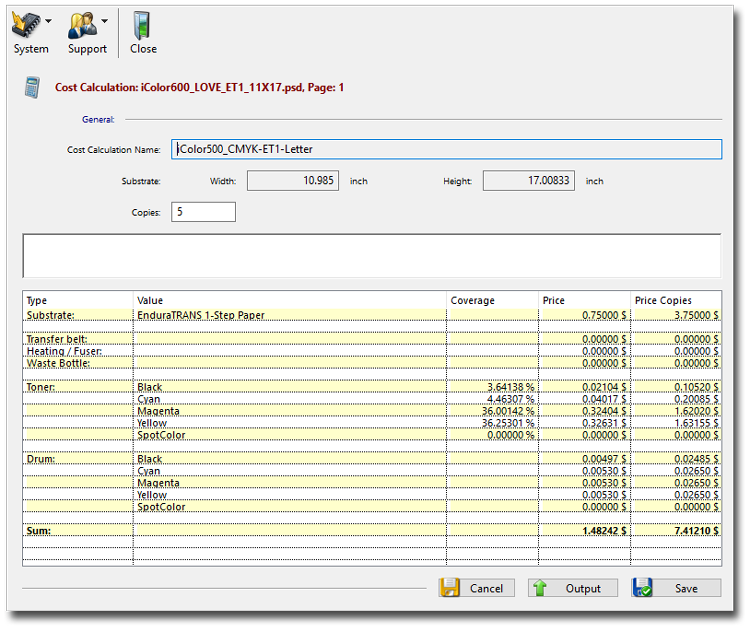 Now that you have the raw data, you can plug it into the Cost Calculator. To do this, return to the TransferRIP home page and click Calculation. 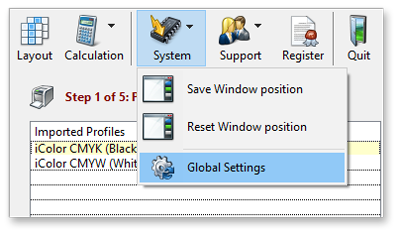 From the drop-down menu, click Calculation Settings (Fig 2). This will open the Cost Calculation Window. Here is where you can enter the cost data and create your configurations. Start by naming the Setting and entering a description. For instance, “CMYK EnduraTRANS 1-Step Tabloid”. This provides useful context for your cost calculations. Paper & Toner: In the Substrate window, enter the type of paper. Below that, enter the price per sheet, then the sheet size. Since paper size affects cost, you should include the size of the paper in your description and create different configurations for different paper sizes. Then enter the toner and drum cost, yield, and coverage information using the guidelines from the User Manual referenced above, and your price for toner and drum cartridges. If you need a handy reference for toner and drum costs, you’ll find them here. Click here to get transfer paper prices. Fig 3. Enter toner and paper price information. CMYK or CMYW: OKI WT owners will be using their printers in CMYW mode. iColor 500 adn 600 users have the option of printing in CMYK. If you’re in the iColor camp, remember that you only use four of the five toner cartridges at a time. You should only enter data for four toner cartridges in any configuration you create. If you’re building a CMYK configuration, leave zeros in the SpotColor fields. If you’re printing with the CMYW toner set, zero out the black toner data and enter the white toner information in the SpotColor data fields (Fig 3). Once you’ve entered all the data, click Save to finish setting up the configuration. You can skip some steps on the next one by returning to the Cost Calculation Screen and using the Duplicate function. Duplicate the first configuration and make only the necessary changes to create the new one: i.e. paper size or toner set. Since white toner has a higher cost and lower yield than Black, your CMYK transfer cost will be different from your CMYW costs. To distinguish between the two, make configurations for the various kinds of transfers you sell. You might have one for CMYK toner printed on 11″ x 17″ sheets of EnduraTRANS 1-Step paper, another for CMYW toner on A4 sheets of UniNet Premium Paper, and so on. Now that you have the RIP configured for dollars and inches, and you have created your favorite configurations, it’s time to run the calculator. The Cost calculator needs to know how large your image is, and how much of each color toner will be used. So to run the calculator, you have to go through the RIP process first. Take the design through the entire process. When you get to the print stage, iColor TransferRIP has all the essential information about the size, color, and saturation levels of your design. Find and click the Calculation button at the bottom of the print screen. TransferRIP opens a separate window that shows all of your saved configurations. Click the one that applies and highlight it. Then click Select in the lower right corner to launch the calculator. TransferRIP will generate a report showing the cost per copy and total cost if you’re going to print more than one. Now you have some solid data for pricing. In this case, we see that our 11″ x 17″ iColor 600 Love sample file, printed on EnduraTRANS 1-Step paper, has a toner and paper cost of only $1.48 each. Five copies brings the total to $7.41. This leaves plenty of room for profit and gives you the information you need to negotiate with price-conscious customers. You can save and export this data as a .PDF or .CSV document for future reference (Fig 4). Fig 4. You can save the report as a .PDF or .CSV for future reference. Guessing at profit is not a sound business strategy. Knowing your costs before you hit Print can help you decide what kind of paper to use, how much to charge. 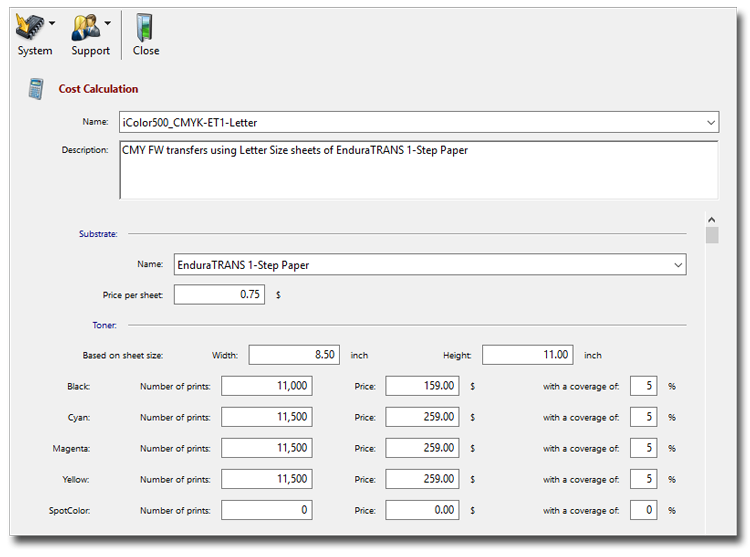 That’s why the TransferRIP Cost Calculation module is such a great resource for serious garment decorators. Got a TransferRIP question? Feel free to post it in the comments below.